The central parts of the starburst galaxy NGC 1313. The very active state of this galaxy is very evident from the image, showing many star formation regions. 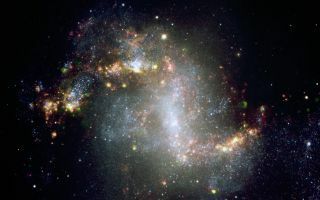 This beautiful space wallpaper shows the central parts of the starburst galaxy NGC 1313. The very active state of this galaxy is very evident from the image, showing many star formation regions. A great number of supershell nebulae, that is, cocoon of gas inflated and etched by successive bursts of star formation, are visible. The green nebulosities are regions emitting in the ionised oxygen lines and may harbour clusters with very hot stars. This colour-composite is based on images obtained with the FORS1 instrument on one of the 8.2-m Unit Telescope of ESO's Very Large Telescope, located at Cerro Paranal.